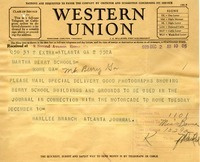 Willis notifies Berry that a balance is due on her account at photographers Bachrach, Inc.
Harllee Branch asks Miss Berry to send the photographs of the Berry Schools and grounds to be used in the Atlanta Journal in connection with the motorcade to Rome on December 10th. 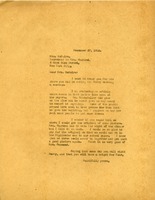 Handwritten note from photographer Elizabeth Ogden Wood inviting Martha Berry to attend the December 1928 exhibition of her work at the Art Center in New York City. 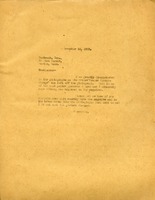 Written on the exhibition announcement. 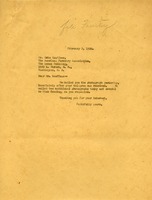 Martha writes Mr. Rowlett to inform him, she is sending photos that he can use in his rotogravure section. 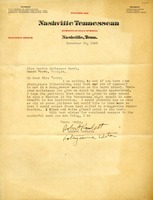 Robert Rowlett, the rotogravure editor, asks Miss Berry if she has photographs of the work of The Berry Schools and of herself to be used in a rotogravure section of the Nashville Tennessean. 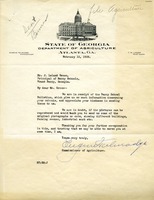 He hopes that the publicity given to The Berry Schools from the feature will be beneficial to the Schools. 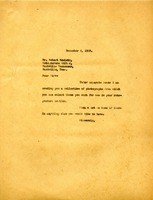 He asks for more than 6 or 7 pictures so he can choose the best photos to use in the rotogravure reproduction. 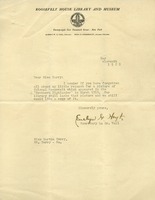 Hoyt responds to a request to provide details about the photograph needed at the Roosevelt House Library & Museum. 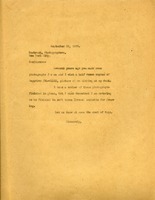 Hoyt, from the Roosevelt House Library & Museum, had requested a copy of the photograph of Theodore Roosevelt that appeared in the March 1919 Highlander. 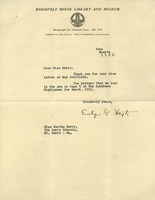 Berry asks for clarification so that the correct photograph can be sent. 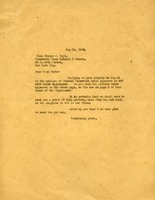 Letter requesting a copy of a picture of Colonel Roosevelt that appeared in "Southern Highlander" for the Roosevelt House Library and Museum. Appears to be a second request. 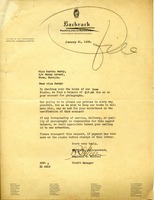 Clifford A. Ohnemus writes on behalf of photographers Bachrach, Inc., explaining that the Prayer Changes Things motto was omitted from photographs because of the size of reproduction requested. 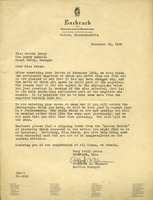 Ohnemus assures Berry that the negative is intact, Bachrach will reprint the photographs with the motto, as requested, and encloses a clipping from the Boston Herald. Berry complains that the motto "Prayer Changes Things" was omitted from photographs provided by Bachrach, Inc.. She expresses concern about the safety of the negative and asks that the photographs be reprinted. 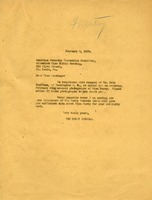 Martha writes asking about getting copies of photographs in soft tones to frame.